The Benidorm Costa Blanca area of Spain is a great camping place and to take your caravan, especially if you want to enjoy the winter sun. But, before you leave for sunnier climes you must make sure that you are adequately covered. Check that you have both travel insurance and health cover and that the insurance covers you for Spain and any other countries you need to travel through. Ensure that your caravan or motor home is covered adequately. There are many companies who will give European-wide cover for you and your caravan. Caravan clubs, like the Caravan Club UK, also offer insurance cover so that you can continue your holiday even if you lose both your car and caravan. Do not leave home without insurance. 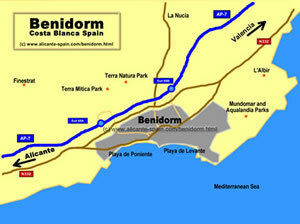 There are some great campsites in the Benidorm area which offer a huge range of facilities. Many offer discounts for long stays and also storage for your caravan. This campsite is situated in Benidorm town near to the Levante Beach which offers a range of water-sports and a beautiful sandy beach. The campsite takes both short term and long term (from 2 months) bookings. It can be found off exit 65 of the main AP7 motorway. Facilities: Electric and water hook ups for caravans, waste, Gas service, drinking water, hot water in showers and washrooms, satellite TV connection, telephones, cash machines, bars, cafes and a restaurant, medical services, supermarket, laundry, swimming pools for adults and children, safe deposit boxes, security and CCTV system. Pets are allowed. This campsite is situated on the Av. Communidad Valenciana which is just a few minutes from both the town of Benidorm and its beaches. It is situated off exit 65 of the AP7 or the Playa Levante exit off the N-332. Facilities: 300 plots with electricity (120 of these also have waste) with bushes separating the plots. Other facilities include bar, restaurant, laundry service, post service, supermarket, medical services, telephones, hot water and heating in the toilet and shower blocks, disabled toilets, car parks, car wash, flat tarmacked roads, swimming pool with slides (open Easter – October), children’s playground and sports facilities – tennis courts, mini golf, driving range, petanque and jogging track. This site is also in the Levante area of Benidorm, near to the town and beaches. It is open all year round and also offers caravan storage and long term stays. Facilities: Electric, gas, water and waste, showers and toilets, parking, laundry, satellite TV, telephones, post service, medical services, shops, restaurants, swimming pool, children’s play area, safe deposit boxes, disabled access and the site allows pets. 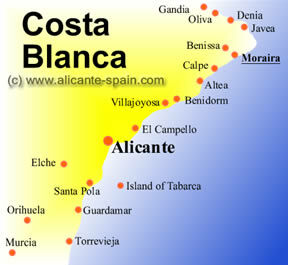 Camping Cap-Blanch is situated on Playa Cap-Blanch about 2km from the town of Altea near Benidorm. You can find full directions on its website but it is found off the AP7 and N-332. The site is around 40,000 square metres but you cannot reserve your plot so make sure you telephone before you go. Bungalows and chalets can be booked. Facilities: The usual facilities plus hot water, bar and restaurant, social club, children’s play area and activities and entertainment at Easter and during the Summer, tennis court, wooden tables and 12 barbecues dotted around the site, satellite TV connection and safety deposit boxes. This campsite is situated on the Carretera del Albir km 0.3 Benidorm. It is ideally situated for the beautiful Levante beach and offers discounts for long term stays. Facilities: 650 plots with electric, water, satellite TV connection, solar hot water for showers and toilet blocks, three swimming pools including a heated pool for winter use, children’s play area, supermarket, entertainment centre which is open in Winter too, Internet cafe, bars, restaurant, medical services, laundry service and sports area. Excalibur – camping-medieval.com – a medieval themed site near Benidorm.